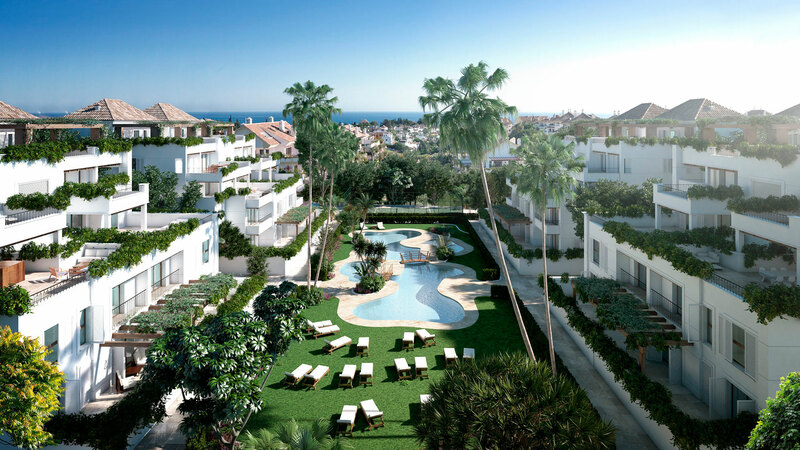 We have already started the building works for the last phase of our emblematic urbanization Lomas del Rey in Marbella. We are located in one of the most exclusive residential areas of Marbella, at the heart of the Golden Mile, next to Puente Romano and Lomas de Marbella Club. This last phase comprises of 24 properties which are projected with the same high quality and luxury standards of previous phasesand which aregreatly valued by our clients. This last phase will also incorporate new energy systems, architectonic solutions and characteristics of the most cutting edge architecture. We commercialize these properties with the logo: “As always…..as never before”, in such a simple statement, we are describing to perfection what we are aiming when launching these apartments and penthouses to the market: to bring tradition and modernity together. Great community areas with exuberant gardens, a social club, a fitness club, four swimming pools, full maintenance service on demand, 24 hours security and a wide range of after sales services are the hallmarks of Lomas del Rey. Providing the complex with a status of prestige, comfort, quality and service to its owners, which is exclusive to its location. Lomas del Rey also counts on a superb location, within 10 minutes to tan yourself on the beach or for a round of golf at a host of golf courses, half way between Marbella Centre and its many trendy restaurants and the most exclusive shops in Puerto Banus, and only 40 minutes from Malaga airport. The development of the concept of Lomas del Rey in its last phase aims to improve those aspects which adapt the properties to the more demanding conditions of luxury and comfort. AS it is usual, Grupo JAMSA, executes their own products and in this case, the construction gets together the best solutions with regards to climatization and isolation. After many months of study, a latest generation energy system which combines aerothermal and geothermal solutions has been adopted. Until now, these systems were only installed in villas and individual luxury dwellings. These inexhaustible energy sources which are an example of environmental sustainability, will allow an improvement of electric consumption of each property, which will result in having a constant domotic climatization by under floor heating-cooling with a minimum expense, 24 hours a day, 365 days of the year. Also, the geothermalinstallation will control thetemperature of both the individual private swimming-pools which the properties mayhave, as well as the communal swimming-pool, thus, increasing the possibilities of use the outdoor swimming pools the whole year round. Additionally, with the experience gained during the last years, this last phase will offer the clients that so wish, a series of comfort features among which stands out the private swimming pools with the possibility of counter current swimming. With regards to the specifications and finishing’s, this last phase will maintain the same criteria of distribution and exterior aesthetics, in line with the elegant setting of the complex, but improving the outstanding qualities of interior finishing’s: noble materials used in floors and enclosures, top of the range fully equipped kitchens, centralized domotics with possibility of remote control by smartphones, etc. The properties are mainly composed by 3 bedrooms, 3 bathrooms and 1 guest toilet, open plan penthouses and wide terraces in all properties, with terraces occupying an area equal to at least 50% of interior areas. The design of the exterior enclosures will allow a comfortable and easy accessto its wide terraces. To summarize, a perfect combination of the highest qualityfinishing’s, the most advanced technical solutions and the high standard of comfort typical of our properties. "Lomas del Rey, as always… as never."